Movies are displayed by title, genre, and loan status. You can search for movies in your collection and enter a “loan status” to keep track of who you lend a movie to or borrowed it from. – Scan barcodes directly into the app using the fastest and most accurate scanning software available for the iPhone, via the built-in and ready-to-use Red Laser SDK! 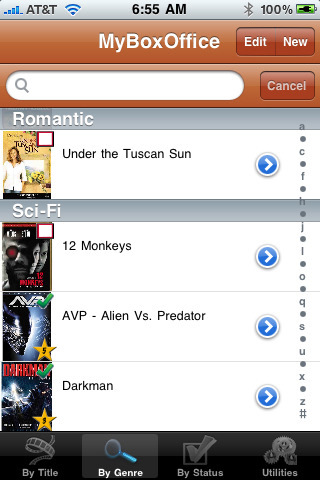 – Tilt your iPod to landscape view and view your movie covers in “shelf view” mode. – Email backup files (CSV or binary) to a location of your choice. – Import your own data (CSV format) or backup files. – Not sure what to watch? While in cover view, shake iPod and a random movie will be chosen for you. – Watched/Unwatched status is displayed in the main lists. – While editing an entry, tap on the cover image to search the internet for additional cover image options. – Set default values and list font size in iPod settings app. * Web Browser Support! – Turn on the built-in web server to access your database directly from a desktop web browser! View and sort your entire database from your desktop! Backup and restore your database without any additional software!